Are you willing to line up for food? I’m not talking about a quick 20 minute line up that moves at a brisk pace, I’m talking about waiting in line for hours just to get a taste of something you’ve heard is good. I’m pretty much a sucker for hype and have totally waited in lineups not knowing what I was getting into. Even with my history of patient waiting, I’ve found that the line ups here in Tokyo put me to shame. There are literally queues for anything and everything that has a whiff of hype. Line ups aside, the pancakes are pretty good in Tokyo. I haven’t been to Eggs and Things, but I have gone to some other pancake houses. Hoshino has insanely fluffy soufflé pancakes that I am totally going to try to recreate and Butter serves a Japanese style hamburger patty and fried egg on their pancakes. It goes to show, pancakes are perfect for fooling around with. 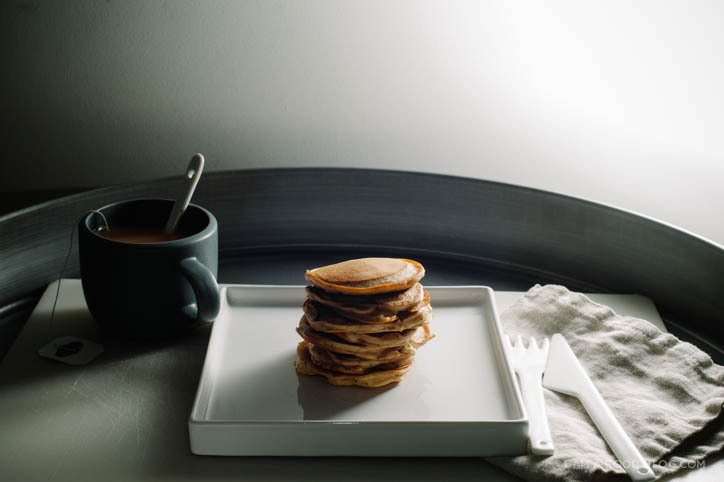 Pancakes are the perfect blank slate for flavour. They’re pretty adaptable and since I love Earl grey tea lattes, I decided to make a Earl Grey pancake. Earl Grey tea lattes are basically Earl Grey tea, steamed milk and vanilla syrup. 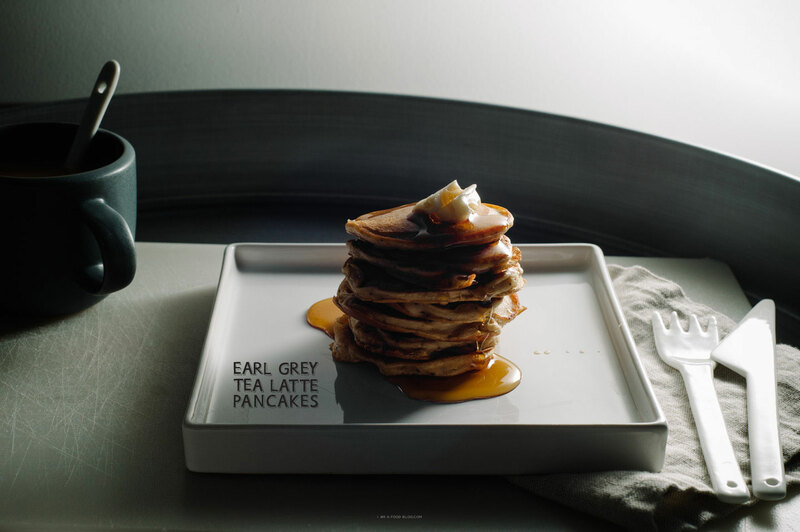 These pancakes are essentially the same: Earl Grey steeped in warm milk with a splash of vanilla. They’re awesome with a smidgen of butter and syrup. I didn’t make vanilla syrup, but I think if I did, it would take these pancakes over the top. Preheat the oven to 225°F. In a small saucepan, bring the milk and tea bag to gentle simmer. Remove from the heat and let seep for 5 minutes or longer if you’d like a stronger tea flavor. 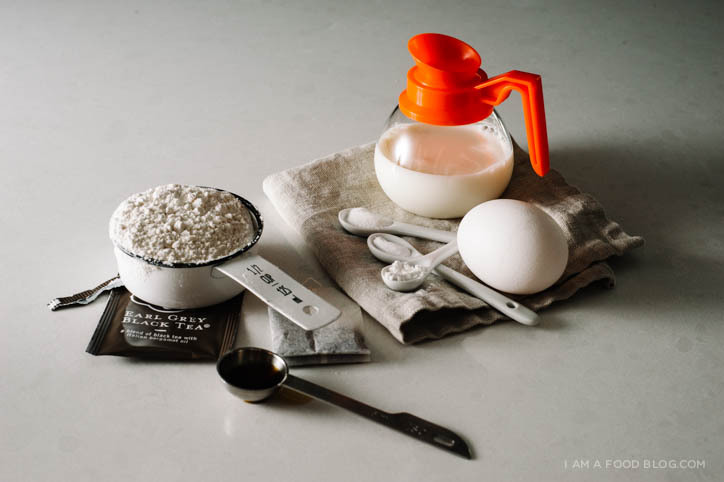 Mix together the flour, baking powder, baking soda and sugar in a bowl. When the milk tea mixture is completely cool, remove the tea bag, making sure to squeeze out as much liquid as possible. Whisk the milk with the egg and vanilla. Add the wet ingredients to the flour mixture. If desired, add 1/4 teaspoon Earl grey tea leaves. Stir until just combined, lumps are good. Let batter sit for 10 minutes. Heat up a non-stick frying pan over medium-low heat. Brush a thin layer of butter or oil on your pan. Drop the batter 1 1/2 tablespoons at a time into the pan. Cook until tiny bubbles appear on the surface, about 2-3 minutes. Flip and continue cooking for 1-2 minutes. Keep the pancakes in the warm oven until you’re finished pancaking. 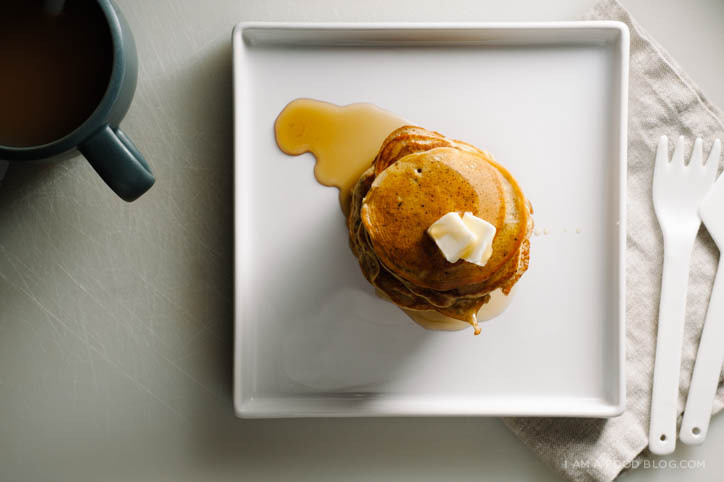 Enjoy warm with butter and syrup. 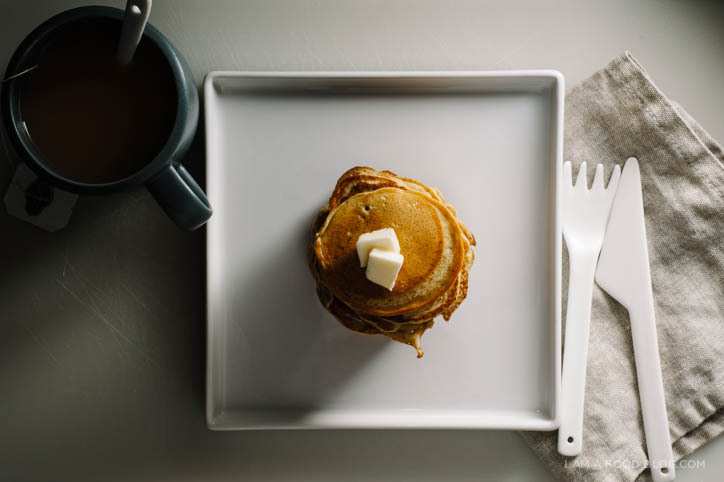 PS – If you’re still craving pancakes, check out my pumpkin chocolate chip pancakes or pulled pork pancakes. Wow, I love this take on the classic pancakes! These sound so neat! I love Earl Grey tea and know I would love these too! Tea is an awesome flavour, isn’t it? Hope you get a chance to try them Katrina! Your blog is amazing and I’m in love. THANK YOU. i love your photography! this post, and the one with chocolate cake in a cup, amazing! will try those pancakes some time this week, i have so much time in the mornings these days with a shifted uni schedule. best regards! I LOVE Earl grey tea!!! These pancakes sound perfect! Could use these right now. A perfect mix of flavors…..yum. I really need to visit Tokyo – I would eat so much. This is a great idea for pancakes. Your photos are amazing as well – do you use a lightbox? No, I don’t have a lightbox, just an external flash that I bounce. I LOVE Earl Grey tea – never heard of a latte but now I’ll have to try one. And these pancakes look wonderful! Tried these today – eating them right now! couple suggestions: too much baking soda for the amount of flour, recommend half teaspoon. Would throw in an extra team bag or two, couldn’t really taste the grey. The pancakes came out dense, maybe I should let stand longer. Going to give this another shot! I made this for breakfast and they were lovely. The only changes I made where that I used WW pastry flour and 2tsp of earl grey for the latte portion. I think I should have let them sit for longer as well but on the whole they were great pancakes. 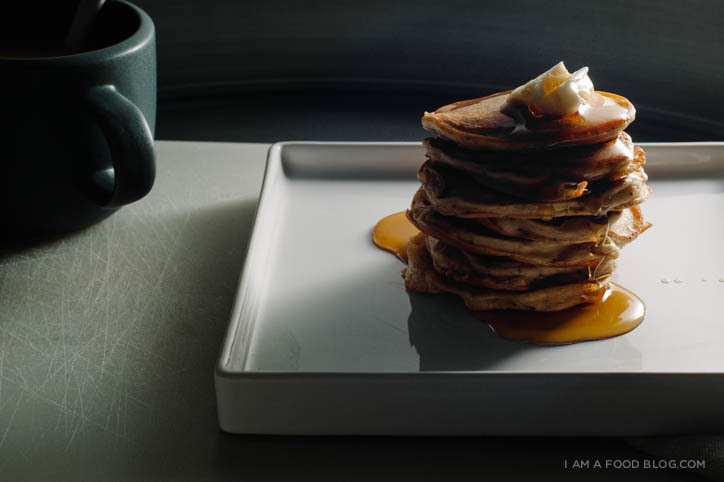 Instead of maple syrup, I mixed together whole greek yogurt, hazelnut oil, and honey and slathered each pancake in it. Thanks for sharing this great recipe! You are very talented Stephanie. Where did you get all this inspiration? I ADORE Earl Grey lattes and london fogs, they’re fabulous. 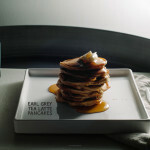 So these pancakes are more than appealing – can you taste the earl grey? How strong are the bergamot and lavender flavours in yours?